Mitch was definitely one of the more “unique” employees we have had here at Lakeview Farms over the years. Mitch definitely preferred singing and entertaining other employees over working. While working, Mitch would always bring a portable radio with a speaker and tune it to a gospel station. He would loudly sing along with the radio while tying up raspberries. Mitch would often try to surprise other employees by sneaking up behind them and then hugging them. One time when all of the employees went out to lunch at Burger King, Mitch staged a mock séance in the middle of the store. Most of the employees resolved not to eat at that Burger King ever again. One time Mitch was asked to test out the Lakeview Farms corn maze. He returned an hour later saying that he had become lost in the corn maze. Mitch was proud of the fact that he had won his school’s male “Mr. America” beauty contest. When asked to supervise a group of customers picking strawberries (his first year) his reply was “What Strawberries?” Mitch always wore a shirt that had a stick figure of a guy doing nothing on it. Above the stick figure was the word, “slacker.” When tying up raspberries, Mitch used hot pink tape. It was his favorite color. He wore 2 pairs of women’s gloves on his hands at once, while working and would also wear gloves on his feet to keep them warm. One time there was a tornado warning and all of the employees went to their cars until the storm passed. Mitch ate Lucky Charms cereal while waiting and said that if he ate enough of the marshmallows the storm would pass. Mitch told a story about how he liked to sleep in showers. Mitch told a story about he slept in a Shnucks parking lot to raise money for a band. Mitch told us he thought that he had seen an alien and would one day be taken join them in the sky. Mitch said he was in the marching band. He wore two right shoes because he lost his left shoe. There were several other memorable stories Mitch told that were unfortunately forgotten over time. In spite of all his antics and strange traits, Mitch did quality work. 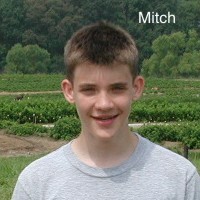 In fact, I made the following entry in my Lakeview Farms employee database at the end of Mitch's first year: "Mitchell was probably the best new employee we hired in the fall of 2001. He did quality work at a reasonable rate and seemed to have a very good attitude." Mitch would just love this pint font color and hate the good words. In honor of Mitch, we have decided to create an award called the Medal of Mitch. This award will go to the employee who has acted the most Mitch-like over the past few years. I am sure that this will be a difficult award to win !